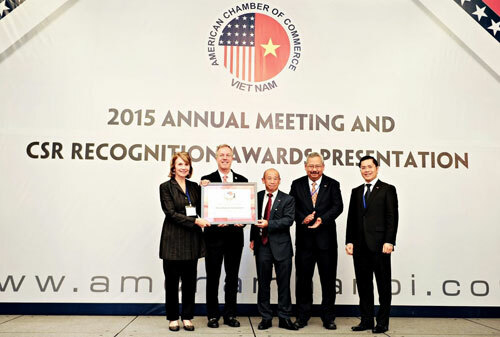 (VEN) - Dow was named Amcham CSR Award 2015 by American Chamber of Commerce in Hanoi – a prestigious organization in American business community in Vietnam - for its smart CSR programs in Vietnam. The award further highlights Dow’s contributions to the country’s sustainable growth after its 20th year of presence in the market. Dow’s smart CSR programs not only finance but also leverage Dow’s technologies and solutions to deal with issues severely impacting lives of the underprivileged. Dow’s typical smart CSR programs in Vietnam throughout its two decades of presence in the country include: Empowering more than 2,200 engineers with knowledge about cleaner production through over 30 workshops on “Training of Cleaner Production and Waste Management for Businesses in Vietnam”; Training ISO 14000 for over 800 engineers in 2015 to improve their awareness on environment protection and sustainable development; Solving the needs of clean water for rural schools and hospitals through more than 20 reverse osmosis water purification systems with a capacity of up to 7,000 liters per day per system. In 2015, Dow in collaboration with People’s Aid Coordinating Committee (PACCOM) has helped over 3,000 pupils and teachers in the country to access clean, safe and certified water; Collaborating with Habitat for Humanity to solve the challenge of decent housing for over 20 underprivileged families and a variety of other meaningful programs in education and healthcare. Acting as a Co-Chair and one of the founding members of Vietnam Business Council for Sustainable Development (VBCSD), Dow has actively contributed to Vietnam’s sustainable development through VBCSD’s action plans and the Vietnam Corporate Sustainability Forum to help Vietnamese businesses enhance their competitiveness in a sustainable way, especially in the context that Trans-Pacific Partnership agreement negotiations were concluded in October 2015. Mr. Tomoyuki Sasama, Vietnam Country Manager, Dow in Vietnam said: “CSR campaigns are an inevitable part of our sustainable growth strategies in Vietnam. 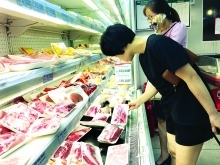 We have a two-decade history of being closely attached to one of the Southeast-Asia fastest-moving markets and we strongly desire to further extend our contributions to the Vietnamese. Amcham CSR 2015 Award is a notable encouragement and pride for us as well when the year of 2015 marks the 20th year of normalization of Vietnam – USA diplomatic relations and it is also the 20th anniversary of Dow in Vietnam”. 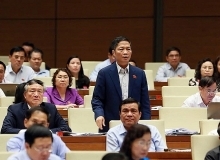 “Our first-ever Corporate Social Responsibility Recognition Award Program is designed to raise awareness of CSR among AmCham members and the community, and to provide recognition to firms with best practice CSR programs in Vietnam”. Apart from long-term CSR programs, during the past two decades, Dow has been actively supporting Vietnam’s farmers and industries to solve the challenges of clean water, clean production and energy as well as improving agricultural yield, which in turn contributes to the sustainable development of the whole society. Dow’s products are not only essential inputs to the vast majority of consumer durables segments including footwear, electronics, appliances, crop protection, water and waste water treatment, home and personal care, communications, alternative energy sector, health and nutrition but they also see a strong presence in transportation and infrastructure materials. Mr. Andrew N. Liveris, President, Chairman and Chief Executive Officer, Dow Chemical Company, said: “Dow’s Sustainability Goals, like the UN’s goals, are not merely business as usual. They will lead us to transformative change. By working together, at the intersections of business, government, and civil society, we can leverage the best of what each of us has to offer – and help create a better world”.